I admit I didn’t know much about Petite Sirah – I thought the name simply signaled a twist on my favourite, Syrah. In fact, it’s a French varietal that is virtually extinct there (since 2002) but that was historically grown in France’s Southern Rhône, as well as Palette, a small Provençal appellation. Now, it’s grown around the world in certain regions including the Yakima Valley (Washington State), Argentina’s Maipo and Colchagua regions and California. The ‘petite’ signals the size of the grape – not the vine, which is quite vigorous. They don’t like rain and tend to rot because the fruit clusters very tightly. These small grapes produce a super concentrated wine – and this is what we have here. 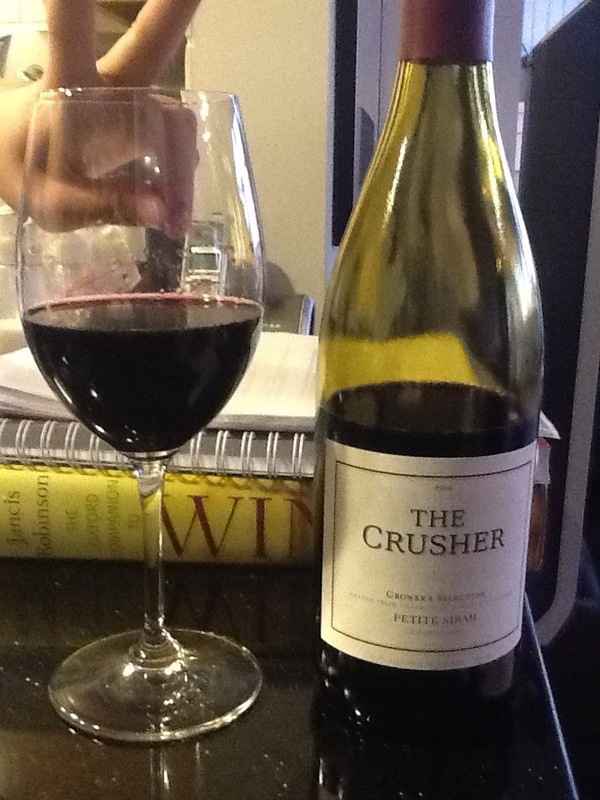 The Crusher is one of Don Sebastiani’s seven product lines. With a deep purple, inky core moving to a thin ruby rim with medium, even legs, this wine is constructed with 76% Petite Sirah and the rest of Merlot. It has good intensity and is developing with aromas of boysenberry, strawberry and very dark chocolate. It has a dry palate with average acidity, strong tannins and intense flavours of dark black Damson plums, ripe blackberries and fig with a black pepper profile. The finish is a little short for what I’d expected. Slightly unbalanced between the grippy tannins, alcohol and concentrated fruit flavours. A WSET Good wine; drink now and don’t hold. This entry was posted in California, California, Merlot, Petite Sirah, RED and tagged california, Petite Sirah, red wine, The Crusher. Bookmark the permalink.